I wrote a response piece to #Brexit for Artistic Directors of the Future. It will be performed at the National Theatre on Monday August 1st by Rebecca Boey & Directed by Jennifer Lim. Details of all the goings on are below. Tix for the full program of talks and artistic responses are available at http://www.adofthefuture.com/events.php. What does Brexit mean to BAME Londoners? What does it mean to BAME artists? It scares us, but it won’t stop us. The politicians have spoken, now let the artists respond. This two day event will feature new writing by the brightest of today’s BAME talent, directed by resident ADF directors, panel discussions with artistic and academic leaders, film screenings as well as an exhibition, all ultimately asking: Brexit Britain: Where do we go from here? With a sudden and alarming spike in racially motivated crime across the UK, threats to cut art from mainstream education and the global message that only a limited few are ‘welcome’, we aim to provide a platform to the many unheard and silenced voices. To shed a light on how issues such as these have impacted those who understand, live and work in these communities and most importantly, what can be done to resolve these issues. Staged in two contrasting yet dynamic parts of the city, both with a rich theatrical and cultural legacy, we will investigate the question from two different perspectives. 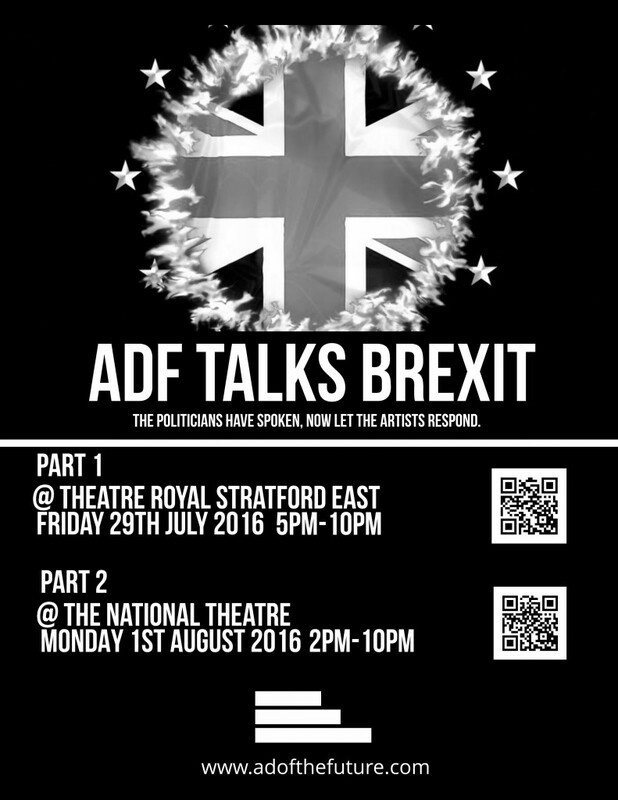 The event will open at Theatre Royal Stratford East exploring Brexit Britain and the Community, with a verbatim scratch performance inspired by real post-Brexit stories followed by an event at National Theatre, Brexit and the Arts which will feature performances by BAME writers and panel discussions. ADF hopes that by providing a safe space for many voices to be heard, it will empower others to engage in the discussion and encourage a collaborative approach to change. Tagged adf, artistic directors of the future, bec boey, brexit, jennifer lim, national theatre.